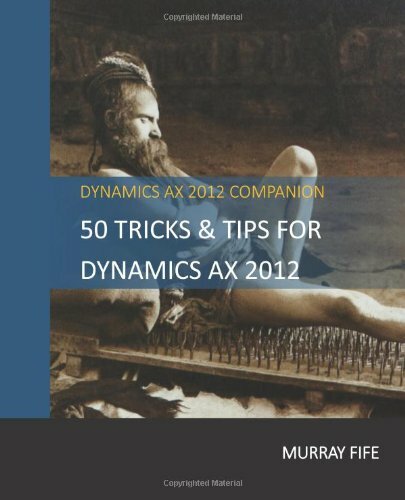 Although getting notifications from Dynamics AX about what it is doing, and any problems that it has come across is good, as you start getting more comfortable with the system, it may be just the errors that you are interested in seeing, and you don’t want to have to close down the InfoLog box every time a new journal entry is created. 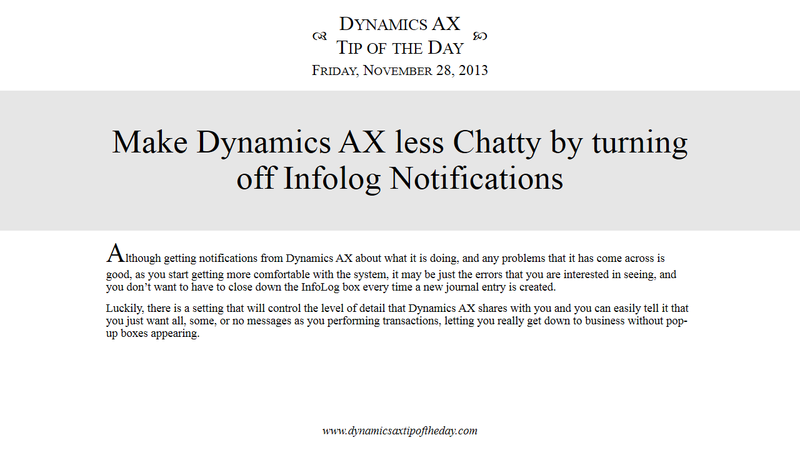 Luckily, there is a setting that will control the level of detail that Dynamics AX shares with you and you can easily tell it that you just want all, some, or no messages as you performing transactions, letting you really get down to business without pop-up boxes appearing. 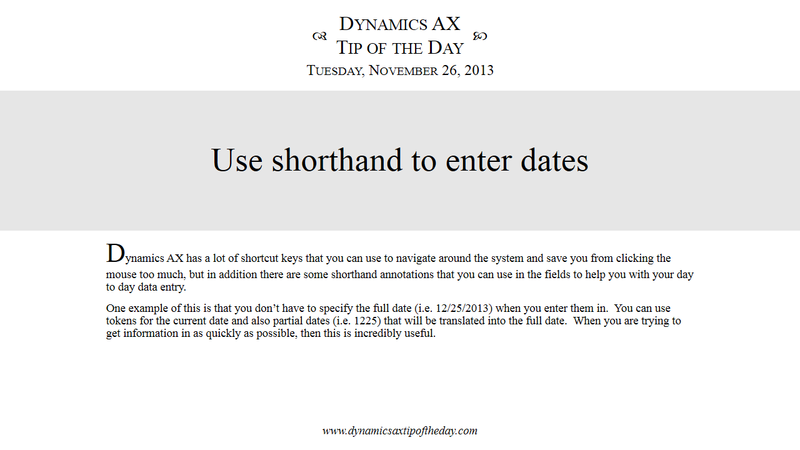 Dynamics AX has a lot of shortcut keys that you can use to navigate around the system and save you from clicking the mouse too much, but in addition there are some shorthand annotations that you can use in the fields to help you with your day to day data entry. One example of this is that you don’t have to specify the full date (i.e. 12/25/2013) when you enter them in. You can use tokens for the current date and also partial dates (i.e. 1225) that will be translated into the full date. When you are trying to get information in as quickly as possible, then this is incredibly useful. 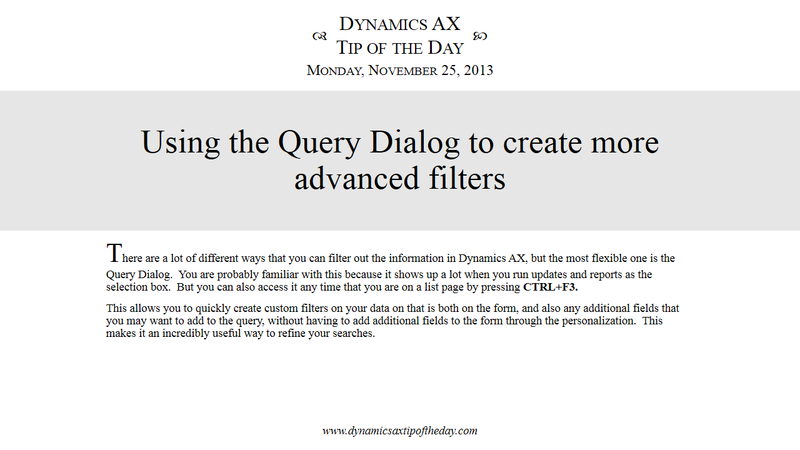 There are a lot of different ways that you can filter out the information in Dynamics AX, but the most flexible one is the Query Dialog. 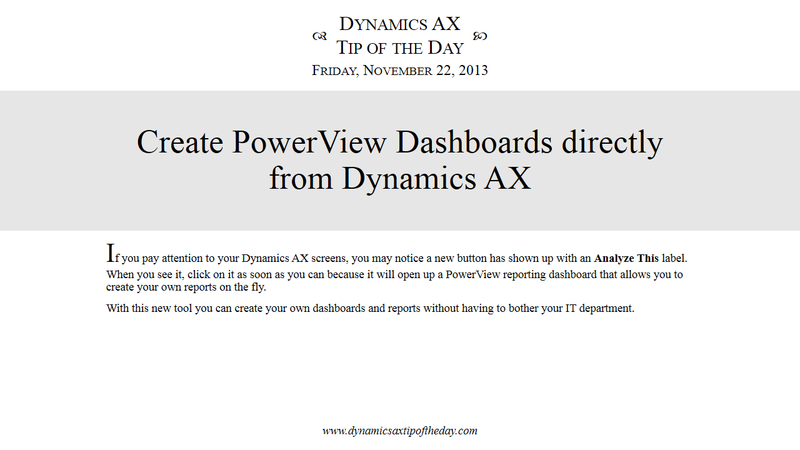 You are probably familiar with this because it shows up a lot when you run updates and reports as the selection box. 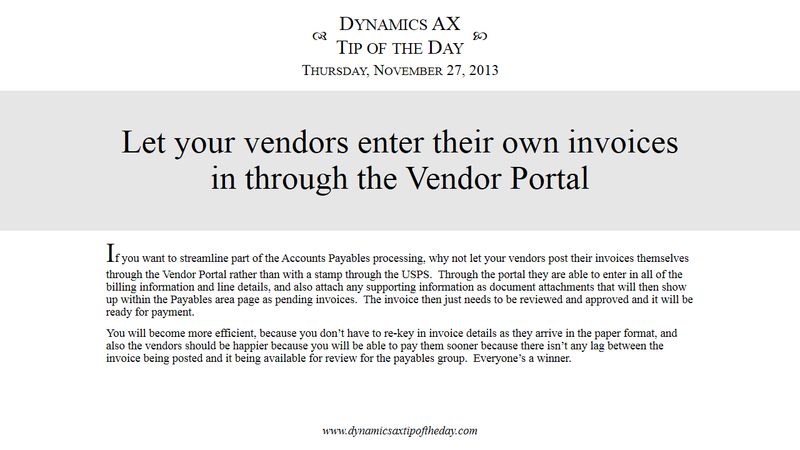 But you can also access it any time that you are on a list page by pressing CTRL+F3. This allows you to quickly create custom filters on your data on that is both on the form, and also any additional fields that you may want to add to the query, without having to add additional fields to the form through the personalization. This makes it an incredibly useful way to refine your searches. 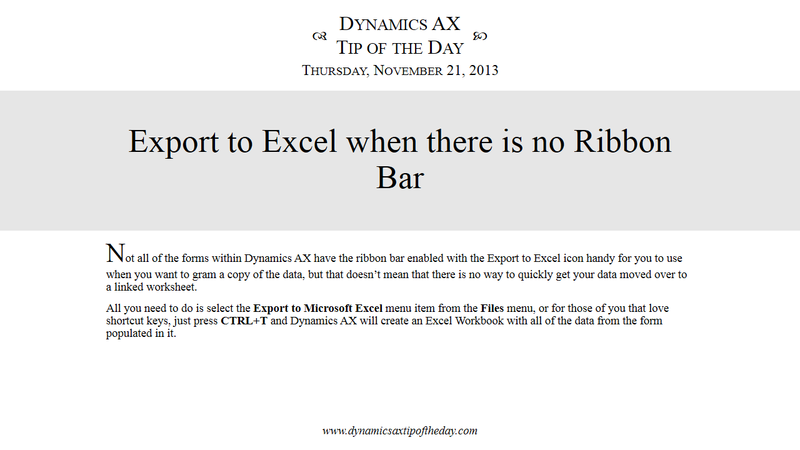 Not all of the forms within Dynamics AX have the ribbon bar enabled with the Export to Excel icon handy for you to use when you want to gram a copy of the data, but that doesn’t mean that there is no way to quickly get your data moved over to a linked worksheet. 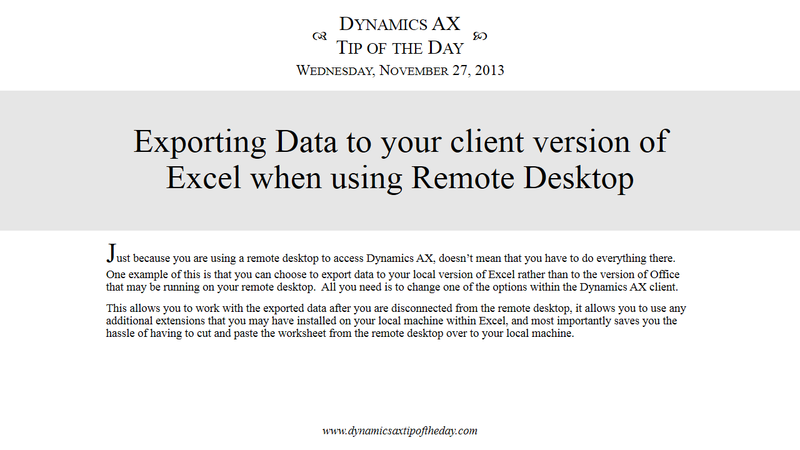 All you need to do is select the Export to Microsoft Excel menu item from the Files menu, or for those of you that love shortcut keys, just press CTRL+T and Dynamics AX will create an Excel Workbook with all of the data from the form populated in it.